On my shelf, I have a wild assortment of dreidls. After all, it is rare that any mitzvah that can be artistic remains unembellished. I have jars of plastic dreidls of all colors, dreidls of silver filigree, dreidls carved of olivewood, ones made of clay, and even one tiny dreidl – easily a hundred years old – made of "oferet yetzukah" – pressed lead. Stories of the origin of the dreidl suggest that the toy and its "gambling" game were used by Chanukah celebrants living under the Roman occupation to circumvent Roman edits forbidding group gatherings, and thereby plan acts of resistance. In later times, opting to downplay the military context of the story, the rabbis emphasized the theme of light, the holiness of the miracle of the oil, and the rededication of the Temple as a spiritual victory over darkness. The great Rebbes of Eastern Europe elaborated on these themes, using the lessons to offer guidance on the inner work we must undertake when we wish to grow spiritually. Reb Nachman of Bratzlav, the great grandson of the Holy Baal Shem Tov, offers this unusual teaching on the dreidl: The dreidl, he says, is a symbol Creation itself. Why? Because all existence is like a rotating wheel. Existence is dynamic, and full of movement, always revolving and oscillating, never static! Yet also, just like a dreidl which spins on a single point, all of Creation too, emanates from point, one root, one Source. The Holy Beis HaMikdash, the Holy Temple when it stood, was also a symbol of this essential nature of Creation. How can we say that the Temple was like a revolving wheel? Because through our sacred service in the Temple, we initiated a movement of the Divine into the world and elevated the world closer to the Divine. God into world and world into God, round and round. The Temple, (like the human heart) Reb Nachman says, is like a dreidl - a rotating "wheel" where God and world spin in a sacred dance. The Temple is an energy cycle, as is the process of redemption. Even the revelation on Mt. Sinai is such a cycle, a holy choreography in which Moshe and God ascend and descend. 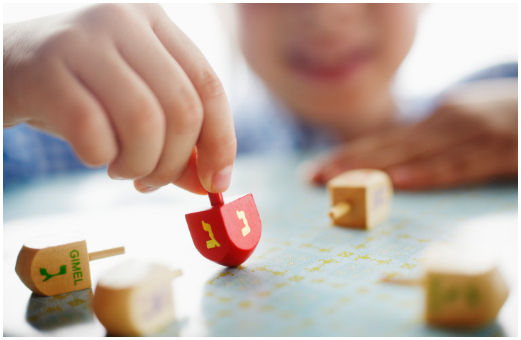 Reb Nachman invites us, as we spin the toy dreidl, to reflect on our own lives. Where are we in our own cycles of ascent and descent? How connected are all our ups and downs? How is God moving in our lives, or have we lost the "point"? Reb Nachman reminds is that the journey of our own souls is like a dreidl. Of course! Whenever a soul descends into the world, a holy possibility is elevated. This holy possbility is the fulfillment of your own soul's unique destiny, the realization of your unique potential to learn, love, and choose the good.